I travel frequently for work generally somewhere between Boston and Tampa, FL. August 13, 2014 I was honored to be a part of a special flight. As I boarded my evening flight home I immediately sensed something about aircraft felt different. Was it a new plane I asked myself? Brighter lights? Less people? Friendlier flight attendants? It was none of those things. The flight was eerily quiet. Our flight was escorting a fallen soldier home to Boston. There were three seats in the bulkhead that were roped off waiting for three young soldiers to accompany a fallen brother home to his family. My usually “quick trip” from New York’s LaGuardia airport to Boston felt like one of the longest trips ever. As passengers we instinctively felt a responsibility to make sure this flight was made special and No one said a word. 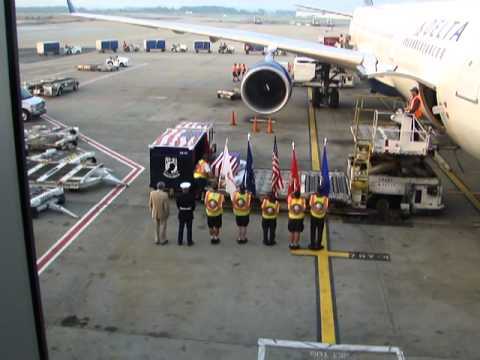 The flight attendants quietly went about their checklists but the passengers sat still and quiet reminded of the tremendous sacrifice this particular soldier have made on behalf of our country. We eventually landed in Boston on a particularly damp, dark rainy night. As we approached our gate I could see flashing lights from what turned out to be firetrucks and police cars greeting our plane. As we pulling into our gate I realized what was going on — state and local police and firefighters were there to salute the fallen solider with their firetruck latter’s stretch as high as the sky and lights beaming even higher. You could hear a pin drop on board. We knew instinctively to remain seated as the three soldiers accompanying our fallen hero stood up saluted the entire cabin, then proceeded outside to remove the casket from the cargo hold all the while 150 – 200 police and firefighters were standing at attention with their broad chests held high in the rain with their hats in their hands. By the end there was not one dry eye on board our flight. For a brief moment we (the passengers) felt more like family than strangers; there for the young man who lost his life fighting for our freedom as a reminder of just how fortunate we all are. Thank you for sharing this with us, Katie!